It’s time, once again, for our annual Top Fantasy Baseball Prospects list. In this, our 14th annual list, we’ve again beefed things up things — going 85 deep for the first time. Note that these rankings represent our take on the top prospects prior to Opening Day. This season, we’ve soared to 43 returnees (plus two more that were 2016 prospects, but dropped off the list last year only to reemerge this season) from our 2017 rankings (10 more from last year), while the number of players graduating to the bigs from last year’s Top 80 prospects rose slightly (up one to 24 this year). Five fewer prospects fell off the list this year (13), telling us that even as we expand the list each year, we’re doing a pretty bang up job of nailing the right players. So that means there are just 42 newcomers (down five from last season), surprising given the increase from 80 to 85 prospects this year. It seems that the trend of big league teams rushing their prospects through the system has slowed a tad, hence more returnees to the list than we’re accustomed to. Graduating from last year’s top 80 list: Andrew Benintendi, OF, Boston Red Sox (1); Dansby Swanson, SS, Atlanta Braves (2); Yoan Moncada, 3B, Chicago White Sox (3); Amed Rosario, SS, New York Mets (7); Cody Bellinger, 1B/OF, Los Angeles Dodgers (12); Lucas Giolito, SP, Chicago White Sox (13); Tyler Glasnow (14), SP, Pittsburgh Pirates; Rafael Devers, 3B, Boston Red Sox (15); Manuel Margot, OF, San Diego Padres (18); Ozzie Albies, 2B, Atlanta Braves (19); Francis Martes, SP, Houston Astros (21); Clint Frazier, OF, New York Yankees (22); Josh Bell, 1B, Pittsburgh Pirates (23); Reynaldo Lopez, SP, Chicago White Sox (31); Ian Happ, 2B/OF, Chicago Cubs (36); Bradley Zimmer, OF, Cleveland Indians (42); Jeff Hoffman, SP, Colorado Rockies (45); Hunter Renfroe, OF, San Diego Padres (49); Amir Garrett, SP, Cincinnati Reds (51); Aaron Judge, OF, New York Yankees (56); Raimel Tapia, OF, Colorado Rockies (60); Sean Newcomb, SP, Atlanta Braves (68); Luke Weaver, SP, St. Louis Cardinals (71); and Dominic Smith, 1B, New York Mets (76). Dropping off the list this season: Jose De Leon, SP, Tampa Bay Rays (27); Josh Hader, SP/RP, Milwaukee Brewers (29); Jorge Alfaro, C, Philadelphia Phillies (47); James Kaprielian, SP, New York Yankees (52); Kevin Newman, SS, Pittsburgh Pirates (54); Braxton Garrett, SP, Miami Marlins (55); Erick Fedde, SP, Washington Nationals (62); Yohander Mendez, SP, Texas Rangers (63); Isan Diaz, 2B, Milwaukee Brewers (66); David Paulino, SP, Houston Astros (70); Sean Reid-Foley, SP, Toronto Blue Jays (75); Zack Collins, C, Chicago White Sox (77); and Delvin Perez, SS, St. Louis Cardinals (80). Now go get yourself a super jumbo coffee and sit down to enjoy our tome of prospects. 1. Ronald Acuna, OF, Atlanta Braves (78): This Venezuelan youngster will begin the season in the minors, but is likely just a few weeks away from recall, and will be absolutely worth the wait. Acuna will instantly have an impact on the Braves’ lineup, so stash him now. Oh, did we mention he’s also got a great glove (see video below). Yup, Acuna is a five-tool prospect capable of hitting to all fields with plus raw power. UPDATE: Was promoted and is showing great power in the bigs. 2. Vladimir Guerrero Jr., 3B, Toronto Blue Jays (44): What does Vladdy Jr. have left to prove in the minors? The son of former superstar Vladimir Guerrero, Junior’s walk-off homer in Montreal to win the Jays’ final spring tune up game was the stuff of legends — and he has yet to spend a day as a major leaguer. The only thing holding Guerrero back right now is Josh Donaldson. Be patient; you’ll be rewarded. 3. Eloy Jimenez, OF, Chicago White Sox (11): Jimenez will begin the season at Double-A and await his opportunity to either move into a corner outfield role at Triple-A or skip the level altogether and rise straight to the majors. The former Cub prospect leads a list of Pale Hose prospects that is the envy of every major league team. 4. Victor Robles, OF, Washington Nationals (8): Robles will begin the season at Triple-A, but this five-tool prospect won’t be held back for long. Expect to see him in Washington at some point this season. And if Bryce Harper leaves in the offseason, Robles should step right in to that vacant spot. UPDATE: Robles has been dealing with an elbow injury for the last five weeks. 5. Gleyber Torres, SS, New York Yankees (5): We’re still waiting to see what this youngster can do at the major league level as last year’s injury delayed his arrival in the Show. Torres will likely be a below average player this season, but his future is tremendously bright. Acquired from the Cubs a year and a half ago, he will start paying the Yankees back for that deal around 2019-20 and for years to come. UPDATE: Sure enough, Torres was promoted to the bigs in late-April and through 71 at-bats, his amazing fast transition to the bigs has been a surprise (.324 BA, which would lead the Yankees if he qualified). 6. Michael Kopech, SP, Chicago White Sox (26): Now the top pitching prospect in the game, Kopech has one hell of a heater, but needs to work on his command. Last year, he was a tad more susceptible to the long ball at Double-A. Kopech finished the season at Triple-A, where his K rate — while still superb — slipped. He’ll start there again this year and await his chance in the bigs. 7. Kyle Tucker, OF, Houston Astros (38): Tucker struck out more often last year in High-A before moving up to Double-A, where his BA dipped. He’s trying to break in on a very deep Astro team, but he’s so talented that it’s just a matter of time. 8. Brendan Rodgers, SS, Colorado Rockies (10): Rodgers’ walk rate dipped significantly at High-A last year, and when he moved up to Double-A, his K rate rose quite a bit. So clearly, a bit more seasoning is in order. He’ll begin the season at Double-A, and if the Rockies’ top prospect can improve his strike zone judgment, he’ll move quickly. 9. Nick Senzel, 3B, Cincinnati Reds (20): Senzel’s groundball rate increased at High-A last year, and then was even more pronounced at Double-A. The Reds’ top prospect is a third baseman by nature, but at both Spring Training and at Triple-A, the team has had him work out at shortstop and second base, perhaps with a view of expediting his arrival in the majors. This is one prospect that is highly likely to make an impact in 2018. UPDATE: Senzel is on the DL while he deals with vertigo, but has already resumed baseball activities. 10. Brent Honeywell, SP, Tampa Bay Rays (24): We’re going to have to wait at least another year for Honeywell to reintroduce the screwball back into the majors. He hurt his elbow this spring, necessitating Tommy John surgery that will keep him out until early next year. Honeywell announced himself as a rising star at the Futures Game last season en route to racking up a ton of Ks between Double-A and Triple-A. He remains a stellar dynasty league prospect. 11. Francisco Mejia, C, Cleveland Indians (34): Cleveland’s top prospect will open the season at Triple-A after racking up plenty of total bases at Double-A last year, earning a September promotion. Mejia failed to record an extra-base hit during his time with the Tribe, but he’s likely to see a lot more PT in the bigs this season. 12. Lewis Brinson, OF, Miami Marlins (17): This tall, lean centrefielder has now been traded twice in his young career, this winter moving from Milwaukee to Miami in the Christian Yelich deal. Brinson has major extra-base power, but can struggle to make contact. Still, his defense will keep him in a job while we wait for his bat to come around. UPDATE: Brinson remains in the bigs, but is really struggling with a sub-.170 BA. 13. Bo Bichette, SS, Toronto Blue Jays (NR): The other half of the Jays’ future left side of the infield, Bichette took some time to adjust to High-A after his promotion last year. But once he did, he really took off. Bichette is an aggressive hitter, and assuming he adjusts to Double-A fairly quickly, he’ll likely reach Triple-A by season’s end. 14. Walker Buehler, SP, Los Angeles Dodgers (NR): The Dodgers’ first round pick in 2015, Buehler worked his way through four levels last season. After recording a microscopic 1.10 ERA through five starts at High-A, he was quickly moved up to Double-A, where he continued to enjoy solid hit rates. At Triple-A, Buehler worked mostly out of the bullpen, and then was a reliever exclusively in eight appearances with the Dodgers, earning one win, but one very poor outing ruined his bottom line results. This youngster has a bright future, but will need to prove he can stay healthy after spending time on the DL in each of his professional seasons. UPDATE: Buehler was recalled to the majors in late-April, and looked great in his first four starts before enduring his first rough outing on Wednesday against the Fish. 15. Alex Reyes, SP, St. Louis Cardinals (4): Reyes missed all of 2017 in the wake of Tommy John surgery, but now that he’s nearing a return to full health, he could provide a serious boost to the Card rotation this season. He didn’t get into any Spring Training games, but was tossing bullpen sessions, indicating he’s getting close. Expect him to begin a rehab assignment at the end of April, with an eye towards joining the Cards sometime in June. UPDATE: Reyes is currently on the 60-day DL, but his rehab has started, recently sending him to Class-A. 16. Fernando Tatis Jr., SS, San Diego Padres (NR): Tatis made an impression in Spring Training before being reassigned, so we shouldn’t have to wait too long for him to ascend to the majors. The Padres are simply loaded with young talent, and given that he’ll start the season as the team’s youngest player at Double-A (at 19), it’s clear the team is not balking at moving him quickly. Yet another next generation prospect (he’s the son of Fernando Tatis, who played 11 seasons in the bigs), Tatis the junior has been well-bred in terms of what it takes to get to the Show. 17. Luis Robert, OF, Chicago White Sox (NR): A tall Cuban flyhawk, Robert hit up a storm in his first taste of organized ball last year. A thumb injury will force him to the DL to begin the season, but when he’s healthy he’ll play at High-A alongside fellow ChiSox outfield prospect Blake Rutherford (56). UPDATE: Robert remains out, but is expected to return around the end of May. 18. Triston McKenzie, SP, Cleveland Indians (53): McKenzie is a tremendous prospect, but he’ll begin the season on the DL with a forearm injury — never a good sign for a pitcher as it’s so often the precursor for Tommy John surgery. The righty is scheduled to move up to Double-A, but for now will start the season at extended Spring Training. UPDATE: McKenzie remains on the DL. 19. Forrest Whitley, SP, Houston Astros (NR): Clayton Kershaw, Zack Greinke, Dylan Bundy, Chad Billingsley — the only four high school pitchers over the last 20 years to reach Double-A in their first pro season… until Whitley joined the group last season. That gives you some idea of Whitley’s pedigree. Unfortunately, he’ll will miss the first 50 games of the season while serving a drug suspension. UPDATE: Whitley is still serving his suspension. 20. Austin Meadows, OF, Pittsburgh Pirates (6): Meadows enjoyed a nice spring, and if that continues early this season, he may force the Pirates’ hands and get the call to Steel City. Still, he missed a lot of time with injuries last year, so the Bucs may opt to play it safe (and, not surprisingly, cheap) and let him get some more Triple-A time before starting his service clock. As soon as there’s an opening for everyday playing time past June, Meadows will be summoned to the bigs. 21. Mitch Keller, SP, Pittsburgh Pirates (32): Rising 11 spots from our 2017 Top Prospects rankings, Keller got over half a season’s worth of starts at High-A last year before a promotion to Double-A, where he was even harder to hit. Pittsburgh’s 2014 second round pick will begin the season back at Double-A, and if he keeps dominating, next stop will be the bigs. 22. Willie Calhoun, OF, Texas Rangers (NR): Calhoun seemed to have a chance to win the left field job in Texas this spring, but was sent down to the minors for more seasoning. The former second baseman was part of the booty Texas received for Yu Darvish, but the team felt he needed more outfield reps before being ready for the bigs. There’s no question about Calhoun’s bat, however, and while he’ll start the season at Triple-A, he’s still a serious AL ROY candidate assuming he gets the call sometime in the first half. 23. Hunter Greene, SP, Cincinnati Reds (NR): The second overall pick in last year’s draft, Greene could have easily gone first. He’s got that kind of upside. Armed with a triple-digit heater, Greene was also a superb infielder, but his future as a major leaguer is on the mound. In his very brief pro debut last year, he was lit up pretty hard, but it was a tiny sample size. Greene’s effortless delivery will have him eating up minor leaguers in no time. 24. Royce Lewis, SS, Minnesota Twins (NR): And right behind Greene is last year’s No. 1 pick, Lewis. After racking up a goodly amount of total bases in Rookie ball, Lewis was promoted to full season ball and proved productive — as an 18-year-old. With little to block him at High-A, he’s likely to advance quickly this season. 25. Alex Verdugo, OF, Los Angeles Dodgers (48): Verdugo was sent back to Triple-A late in Spring Training, and while he got plenty of experience at that level last year (and a bit in the majors, too), he’s simply blocked right now as the Dodgers have a ton of options. Even Andrew Toles, who has already proved he can hit major league pitching, is waiting for an everyday gig, so Verdugo could wind up being a trade chip. UPDATE: Verdugo was recalled to the Dodgers in late-April, hitting decently before being sent back down on May 9 when the Dodgers needed to recall pitching help. 26. Willy Adames, SS, Tampa Bay Rays (16): A popular preseason pick as the AL ROY, Adames will begin the season at Triple-A, but is expected to get the call by the Super Two deadline, if not earlier. Although Adames has yet to go deep this season, he’s averaging an extra-base knock per game in the early going. Even the Rays can’t hold him back for long, can they? UPDATE: Adames has homered a few times now, and continues to rake, but Tampa Bay still hasn’t recalled him. 27. A.J. Puk, SP, Oakland Athletics (67): Puk will certainly slide on most top prospects lists in the wake of his Tommy John surgery, but this is where we liked him long-term heading into 2018. Dr. Andrews worked his magic on Puk, so expect to see the A’s top pitching prospect back around Spring Training next year, with an eye towards getting back into game action by mid-season, 2019. 28. Mackenzie Gore, SP, San Diego Padres (NR): The third overall pick in last year’s draft, Gore has elite strikeout capability and looks like a tremendously advanced pitching prospect who really only needs to slightly improve his control to move very quickly through the Padre system. This kid is the real deal, so expect to see him come in next year as one of the game’s top pitching prospects — especially since he’s already in the top 10 of his position. 29. Leody Taveras, OF, Texas Rangers (64): Signed by Texas out of the Dominican Republic in 2015, Taveras has progressed through the lower levels of the Ranger system in short order. Last year, he made his debut at full-season ball, racking up nearly a hit per game with developing pop and more speed. Taveras is continuing to hit at High-A early on, starting to show signs of productivity. Considering he doesn’t turn 20 until after the minor league season, but could easily work his way up to Double-A this year, he’s on a great trajectory to be a big leaguer before he can legally drink in the U.S.
30. Austin Hays, OF, Baltimore Orioles (NR): Baltimore’s third round pick in 2016, Hays worked his way from High-A to the majors last year. Many thought he’d win a job of Spring Training, but Baltimore has opted to take it slow with him, starting him back at Double-A this season. Hays will certainly be under a bright spotlight there, but early on, his extra-base pop has left something to be desired. Once he heats up, though, he’ll be B-More bound in no time. 31. Kolby Allard, SP, Atlanta Braves (41): There are those not as high as Allard as we are, but for our money, he’s the Braves’ top pitching prospect, and their second best prospect overall. He’s begun the year at Triple-A, but should be in Atlanta before long, especially after looking so sharp this spring. It was great to see Allard stay healthy enough last year to get a full workload in, and while the jump in innings pitched over 2016 is slightly worrisome, the fact he pitched so well this spring should alleviate any concerns. UPDATE: Allard was solid in his first three starts (3.68 ERA), but has been ridiculously good over his last four (0.66 ERA). 32. Juan Soto, OF, Washington Nationals (NR): Soto is absolutely tearing it up at Class-A this season, piling up the extra-base hits as he tries to force his way up to High-A early on. Don’t be shocked if he earns a very quick promotion as he clearly has nothing left to prove at this level. If this continues, Soto may find his way up to Washington before he turns 21. UPDATE: Sure enough, Soto was promoted to High-A in late-April, but after proving he was too good for that level after just 15 games, he got another bump, this time to Double-A, on May 10. 33. Anthony Alford, OF, Toronto Blue Jays (79): Alford’s first full season in the bigs will be delayed as he’s currently on a rehab assignment while dealing with a hamstring woe that will sideline him for the first month. This kid is uber talented, with developing power, but has struggled to stay healthy. UPDATE: After his rehab assignment, Alford was optioned to Triple-A on April 19. He was recalled to Toronto on May 5. but optioned back to Triple-A on May 14. 34. Sixto Sanchez, SP, Philadelphia Phillies (NR): Armed with a fantastic baseball name, Sanchez moved to full-season ball last year and immediately proved he can win. Bumped up to High-A for the final month, he found the going tougher, so will begin this season at the FSL again. But with the sinking action he gets on his 100 mph fastball, it shouldn’t be long before Sanchez masters this level and is ready for the next big challenge. 35. Luiz Gohara, SP, Atlanta Braves (NR): This southpaw is currently at Double-A, rehabbing groin and ankle injuries. Expect Gohara to claim a rotation spot on the Braves when he’s healthy and stretched out. UPDATE: Gohara was bumped up to Triple-A on April 21 as part of his rehab, and then optioned to the level a week later. A week and a half ago, he was recalled to Atlanta, and so far has pitched in long relief for the Braves. 36. Franklin Barreto, SS/2B, Oakland Athletics (40): Oakland’s top position prospect offers a nice mix of power-speed potential, and he’s got the arm to play short, but not necessarily the glove to stick in the infield. He started this season in Triple-A and was recalled briefly, but only played in one game and is still waiting for his first at-bat of the season. Expect a midseason trade to open up a job for Barreto in Oakland. 37. Scott Kingery, 2B, Philadelphia Phillies (NR): With his power-speed combo, Kingery has a chance to massively outshine his ADP of 298. There’s a chance he’s not fully ready from a contact perspective, and if the Ks keep piling up, don’t be shocked if he’s sent back to Triple-A for a bit more seasoning. Still, the improved walk rate is great to see, so maybe that will help offset the whiffs. UPDATE: Kingery is playing every day now, but could return to a super utility role once J.P. Crawford returns from injury, possibly at the end of the month. 38. Kyle Lewis, OF, Seattle Mariners (37): No one doubts Lewis’ talent, just his ability to stay healthy. We’re still waiting for him to recover from a knee injury, but he’s expected back in early May. Last year, Lewis had a decent BA at Rookie Ball (helped by a .360 BABIP) and scored plenty of runs at High-A. Hopefully he can stay in the lineup long enough this year for us to finally get a better gauge on his ultimate upside. UPDATE: Lewis was finally on Saturday, and he’s off to a decent start (.250 BA through four games). 39. Ryan McMahon, 3B, Colorado Rockies (NR): Given a chance to play everyday in Colorado this season, McMahon’s extra-base pop has gone AWOL. He recently went 3-for-18 with nine strikeouts and one RBI on a road trip. McMahon needs time to find his groove, but the Rox trying to keep pace with the D-Backs in the NL West, their patience can only last so long. UPDATE: McMahon was optioned back to Triple-A on May 1 and hasn’t exactly tore it up down there, but could get another chance in Colorado with Ian Desmond struggling. 40. Mike Soroka, SP, Atlanta Braves (58): After a superb season (2.75 ERA) at Double-A last year, Soroka has made a seamlessly transition to Triple-A, with tremendously better control early on. His command is off the charts, and he’s yet to give up a dinger. Soroka is ready for the majors and his arrival is imminent. UPDATE: He was promoted to Atlanta May 1, averaging over a K per inning in three starts before landing on the 10-day DL with a shoulder strain on Thursday. 41. Brendan McKay, LHP/1B, Tampa Bay Rays (NR): Moved up to Class-A this year, McKay has looked stellar so far, having no given up a single line drive through two starts. He’s inducing more ground balls, and continues to have success as a two-way player (did we mention he can hit the damn ball too?). UPDATE: On May 14, McKay was promoted to High-A. 42. Franklin Perez, SP, Detroit Tigers (NR): We like Perez a bit more than other pundits, but we’re just impressed with the experience he got at High-A and how he kept racking up the Ks at Double-A last year. Part of the booty Detroit got for Justin Verlander, Perez will miss the beginning of this season with a lat strain, but will start out at Double-A by late-June. Perez could be in the majors for a September cup of coffee. 43. Kyle Wright, SP, Atlanta Braves (NR): How about the stockpile of arms the Braves’ have built up? Wright pitched a few innings at Rookie Ball last year before moving up to High-A, where he failed to win a game, but kept pitching well. He’s already at Double-A to begin 2018, and while he’s still seeking his first professional win, the Ks keep piling up. Wright is an advanced pitching prospect, but will need to get some innings under his belt before moving on to Triple-A or the majors. UPDATE: Wright earned his first pro win on April 21 and followed that up with another W just over three weeks later. 44. Jorge Mateo, SS, Oakland Athletics (57): Mateo was a bit hobbled this spring by a knee woe, but that didn’t stop him from flashing his speed and power potential. He recently endured a career-worst slump at Triple-A by broke out it with a huge triple for his 500th hit as a pro. Once he gets rolling, the A’s will come calling for this kid. 45. Jack Flaherty, SP, St. Louis Cardinals (NR): Flaherty started the season with the Cards, looking very promising in his debut, before being farmed out. There are many that believe he deserves to be the team’s fifth starter, but instead, he went down to Triple-A where he dominated. Now that Adam Wainwright has gotten hurt again, however, Flaherty is expected back in the bigs and is worthy of your Fantasy attention. UPDATE: Flaherty was indeed recalled on May 15. pitching well in his first start back as he tossed a career-high 5 2/3 IP of one-run ball. 46. Kevin Maitan, SS/3B, Los Angeles Angels (61): Extremely hyped, but just as raw, Maitan was granted free agency as part of the sanctions against Atlanta, and the Angels were only too happy to swoop in. He’s starting the season off in extended Spring Training as he’s still looking to break through in short season play. Be patient here, folks. This one’s a long-term project. 47. Keston Hiura, 2B, Milwaukee Brewers (NR): Milwaukee grabbed Hiura with the ninth overall pick in last year’s draft. He’s got a major league bat, flashing it in his pro debut last year with ridiculous extra-base pop at Rookie Ball before more superb hitting at Class-A. Moved up to High-A this year, Hiura has struggled over the first couple of weeks, but in fairness he was dealing with a shoulder injury. He’ll need some time to adjust and be fully healthy before he starts dominating this level. UPDATE: Hiura has picked up his play in May (.306 BA, 939 OPS), but is slumping again over the week and a half (.189 BA in the last 10 games). 48. Taylor Trammell, OF, Cincinnati Reds (NR): The No. 3 prospect for the Reds ranks slightly higher on some pundits’ lists, but we’re waiting to see what he’s capable of at High-A before jumping all in. Trammell did score a boatload of runs in his first crack at full-season ball last year, and he has shown developing power. But we yet to consider him a feared hitter. Give him some time to adjust to this level and we’ll see. UPDATE: Trammell has adjusted well to High-A (60 total bases in 36 games); he’s likely to rise big time on this list next year. 49. Nick Gordon, SS, Minnesota Twins (46): We moved Gordon into the top 50 prospects last year after we felt he had taken a nice step forward. The Twins are being very methodical with him, asking him to start out at Double-A again this year despite the pile of runs he accumulated there last year. Hence, Gordon slipped ever so slightly on our list this year, but the fact he’s hitting the cover off the ball and proving extremely productive at Double-A early on in 2018, suggests he won’t there long. UPDATE: Gordon continues to rake; he’ll likely get bumped up to Triple-A soon. 50. Cal Quantrill, SP, San Diego Padres (69): This Canadian kid, the Padres’ first rounder (eighth overall) in 2016, enjoyed the first winning record of his pro career last year at High-A, but the losses piled up after a promotion to Double-A. Back at Double-A this season, Quantrill was really rolling until his most recent outing, but he’s making nice progress and should be ready for another promotion by mid-season. The son of ex-big leaguer Paul earned an invite to Spring Training this year, so it’s clear the Padres are big on him. Just note that this system is packed with pitching prospects, so some of them may wind up as trade bait. UPDATE: Quantrill bounced back from that rough start with a pair of gems, but has been tagged hard in each of his last two starts. He may need more time at this level than we expected. 51. Michel Baez, SP, San Diego Padres (NR): Did we mention the Padres are loaded with young hurlers? Baez is one at least four San Diego pitchers that are among the top 100 prospects in the game. The 22-year-old righty is a towering (6’8″) specimen the team signed out of Cuba for $3 million. Last year, Baez made one start in Rookie Ball before moving up to Class-A, where he merely whiffed 34 per cent of the batters he faced. He’s currently at extended Spring Training dealing with a back issue, but once healthy, he’ll be headed to High-A. UPDATE: Baez is now pitching in the High-A California League, but is having his challenges, having lost four of five starts as his pitch counts have been too high. 52. Estevan Florial, OF, New York Yankees (NR): This young Dominican showed sweet extra-base pop at Class-A last year before a promotion to High-A, where he continued to rack up the total bases. Florial is back at High-A this season and has started sluggishly, but he seems to be coming around a bit now and still has some impressive counting cats. Once he gets hot — likely anytime now — he will on the fast track to Double-A. UPDATE: Florial recently had a 32-game on-base streak snapped. 53. Alec Hansen, SP, Chicago White Sox (NR): The Pale Hose grabbed Hanson with their second round pick in 2016, and he’s about a year and half away from helping them in the bigs. Armed with a nice fastball-curve combo, he’ll need to improve his command before becoming a serious factor. Unfortunately, he’s been out this year with a forearm strain, and we all know where that can lead for pitchers. UPDATE: Hansen is currently throwing bullpen sessions before he will make starts at extended Spring Training. His recovery will take some time. 54. Luis Urias, 2B, San Diego Padres (NR): Urias is expected to make his MLB debut at some point this season, and he should be able to hit right away. He’s currently at Triple-A, and holding his own. Once Urias starts racking up a few more total bases, he’ll likely get the call. He’ll be a real asset in leagues that track OBP. 55. J.P. Crawford, SS, Philadelphia Phillies (9): Crawford showed more power at Triple-A last year than ever before, but his speed waned significantly, and that’s really hurt his Fantasy prospects. He got a September promotion, but the power didn’t follow to the bigs. 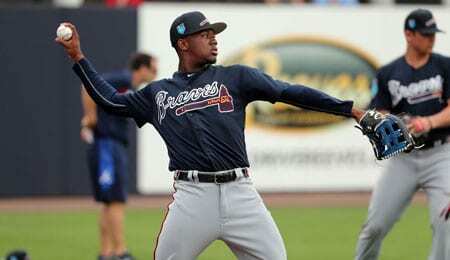 Crawford has graduated to the bigs as the team’s starting shortstop this year, but he hasn’t shown any speed yet. If you own him, be worried that the Phils may try to make a run at Manny Machado in the offseason. UPDATE: Crawford (right forearm strain) landed on the DL on April 29. He’s making progress in his recovery and should head out on a rehab assignment soon. 56. Blake Rutherford, OF, Chicago White Sox (39): Rutherford was racking up the extra-base hits at Class-A before the Yanks sent him to the White Sox as part of a blockbuster deadline deal last year. After the deal, his extra-base pop really slid. Even so, Chicago moved Rutherford to High-A this year and he’s bounced back in a big way, posting his highest wRC+ since his pro debut. 57. Chance Adams, SP, New York Yankees (NR): Adams’ strikeout rate dipped at Double-A last year, but he sharpened his command after a promotion to Triple-A. Back at Triple-A this season, his command has slipped a bit. Adams remains one of the Yanks’ top prospects, but it’s clear a bit more seasoning is in order before he’ll be ready to take on big league hitters. UPDATE: He may be coming around now, looking filthy good on Wednesday. 58. Justus Sheffield, SP, New York Yankees (72): The Yanks have a nice collection of solid arms on the way as well. Could Sheffield be the next home grown rotation star? Technically, he was drafted by the Indians, and then dealt to New York in the Andrew Miller trade in 2016. Sheffield enjoyed a solid year at Double-A in 2017, but after some slight injury issues, he’s started out there again this season. The rate of dominance and the fact he’s giving up fewer hits to centre field this season suggests he’s ready for Triple-A, and soon, the majors. UPDATE: Sure enough, Sheffield was promoted to Triple-A on May, but after two solid starts, he landed on the DL on Saturday with shoulder stiffness. 59. Yadier Alvarez, SP, Los Angeles Dodgers (30): After a disturbingly high ERA last year at High-A, Alvarez has slipped on most prospect lists this year, but he still has great potential as a high strikeout hurler. The fact that he put up a much better ERA after a promotion to Double-A last year was a great sign. However, Alvarez remains at Double-A this season, and is off to another slow start, failing to win any of his first three starts. UPDATE: Alvarez still hadn’t won through five starts before landing on the DL on May 6 because of a groin strain. 60. Matt Manning, SP, Detroit Tigers (73): Manning is showing some progress at Class-A this year despite the fact he’s winless so far and has been prone to wildness. His stuff is almost unhittable and he can absolutely dominate hitters, but he needs plenty of refinement before he’ll be ready to advance. As Manning learns to pitch to contact a bit more, he’ll find the wins coming as he sticks around in his starts long enough to actually earn them. UPDATE: Manning through a gem on May 9 to bag his first win, but the 16 walks in 20 2/3 IP illustrates how much work he still has to do to rein in his wildness. 61. Jesus Sanchez, OF, Tampa Bay Rays (NR): This 20-year-old Dominican is ranked inside the top 50 on some prospect lists, but given that he had yet to play beyond Class-A before 2018, we wanted to see how he’d do at a higher level. The answer so far is fantastic, thank you very much. Moved up to High-A this season, Sanchez is showing tremendous power early on. Expect to see him much higher on this list a year from now. 62. Tyler O’Neill, OF, St. Louis Cardinals (50): This young, powerful Canadian flyhawk was recently recalled the Cards, but with their crowded outfield, he didn’t get much of a chance to show what he can do. Sent back to Triple-A, O’Neill will wait for an injury to get what will hopefully be a longer look in the bigs. He looks like a nice stash for the second half. 63. Jake Bauers, 1B/OF, Tampa Bay Rays (74): Bauers knows how to hit and has great on-base skills, but got off to a sluggish start at Triple-A this year. He’s turned things around a bit over the last couple of weeks, but is still capable of more — especially in the BA department. We really like the fact that he brings a nice mix of decent pop, good speed and solid BA to the table. UPDATE: Bauers has continued to shake off that slow start, batting .324 with six runs and four walks over the last 10 games to raise his slash line to a career best .279/.354/.481. 64. Dylan Cease, SP, Chicago White Sox (NR): Last year, Cease was pitching well at Class-A before getting dealt by the Cubs in the Jose Quintana deal. Cease remained at that level after the deal, but went winless down the stretch. Moved up to High-A this season, he’s rolling now, recently tossing two-hit ball over a career best seven scoreless innings as he retired 19 straight at one point. One of the top prospects on the White Sox also fanned a career-best 12 in that start. Cease can reach triple digits with his heater, so small wonder he’s in the top 10 in strikeouts among all minor league pitchers as of this writing. 65. Michael Chavis, 3B, Boston Red Sox (NR): When Chavis was drafted in 2014, we thought he had a chance to be one of the first impact Boston first rounders in nearly a decade. He vindicated us when he made a monumental jump last year, scoring nearly a run per game at High-A and then continuing to draw walks at a nice rate at Double-A. Unfortunately, those good vibes went away thanks to an 80-game PED suspension that he’s currently serving. Still, don’t sleep on Chavis as he could still be a factor by next year. 66. Jesse Winker, OF, Cincinnati Reds (NR): Winker continued to show superb on-base skills at Triple-A last year, earning his first look in the bigs, and making it a productive stay. He maintained his rookie eligibility and has now graduated to a full-time big leaguer, hitting .305 through the end of April with a team-best OBP. For some reason, Winker still isn’t playing every day, but that can’t continue if this team actually hopes to win some games. This kid’s strike zone judgment is off the charts, combining with Joey Votto to give the Reds two of the best in the biz in this regard. 67. Ian Anderson, SP, Atlanta Braves (NR): Anderson’s record at Class-A last year wasn’t great, but other than too many walks, he was quite strong. Moved up to High-A this season, he’s winless through his first five starts, but he’s again proved harder to hit. Once he irons out his control issues, the results will follow and he’ll move fast to join what’s expected to be a great young rotation in Atlanta. UPDATE: Anderson remains winless, but his hit rates are fantastic. 68. Mickey Moniak, OF, Philadelphia Phillies (28): Moniak remains on this list based on being the No. 1 overall pick in 2016, but we’re still waiting for that studly pedigree to take hold. He’s struggled more with each promotion the Phils have given him. Last year, he did not hit well at Class-A, yet was moved up to High-A this year, where his extra-base pop has been almost non-existent. Moniak’s strike zone judgment is abysmal. He’ll be off this list next year unless we see a dramatic turnaround over the next three or four months. UPDATE: Moniak showed some life with a recent six-game hit streak, but his extra-base pop is still mostly AWOL. 69. Adrian Morejon, SP, San Diego Padres (NR): Morejon has a nice fastball now, but in time, his changeup should be his bread and butter pitch. He made his pro debut last year, and after averaging almost a K per frame at Low-A, he was bumped up to Class-A, where his record wasn’t as good. Morejon has been moved up to High-A this season, and while he’s failed to win any of his first five starts, he’s looking very good for such a young arm (he just turned 19 in February). This lefty is just one several Padre young hurlers that look like they’ll be part of a rotation that could compete for a title in a few years. UPDATE: Morejon has won his last two starts and his BAA keeps dropping with each level he ascends to. 70. Chance Sisco, C, Baltimore Orioles (NR): Sisco’s extra-base sock was nothing to crow about last year at Triple-A, but he did get his first taste of the bigs, seeing action in 10 games. This year, he’s earned a timeshare of the top job, seeing enough action that his counting cats may accumulate to decent totals despite his awful slash line. Hey, at the very least, he has a great baseball name even if he has yet to emerge as a Fantasy force. 71. Christian Arroyo, SS, Tampa Bay Rays (NR): Traded to the Rays in the Evan Longoria deal, Arroyo has always hit for average in the minors and he’s a solid contact hitter. Taken 25th overall in 2013, Arroyo tore it up in Triple-A last year before nearly expended his rookie eligibility in the majors, where his extra-base pop was not as robust. Unfortunately, it was an injury-plagued season, and that carried on into this season. He’s finally healthy now, but the rust is showing at Triple-A as he’s not hitting as well early on. The good news is his bat seems to have woken up over the past week, and he’s starting to produce. UPDATE: Arroyo was recalled to Tampa Bay on May 16, and while he had a fine first game (2-for-5 with a run), he’s not expected to stay long as this is simply an injury recall. 72. Dustin Fowler, OF, Oakland Athletics (NR): The Yanks took Fowler out of a Georgia high school in 2013 with their 18th round pick and then traded him to the A’s at the deadline last year as part of the Sonny Gray deal. Fowler was enjoying a breakout season at Triple-A last year, but upon being promoted to the Yanks, he immediately suffered a season-ending injury. Now healthy, he started slowly at Triple-A this year, but is on a serious tear since the end of April, although his already low walk rate is even lower this season. UDPATE: Fowler was recalled to the majors on May 9, and while he’s struggled to date, he did come through with a single, a walk, a steal and an RBI on Thursday. 73. Jo Adell, OF, Los Angeles Angels (NR): The Angels’ first rounder from last season, Adell has major power potential, as he hinted at last year in his pro debut, split among two rookie levels. Moved up to Class-A this season, he was showing better basestealing skills before hurting his thumb. This kid has a chance to make a major move on this list by next year. UPDATE: Adell was activated a week and a half ago, and has made up for lost time with with a .385/.415/.692 slash line with six extra-base hits and 11 RBI since. 74. Anderson Espinoza, SP, San Diego Padres (25): Espinoza still has serious potential, but injuries have slowed his progress (and obviously dimmed his star, somewhat). Out since August 2016, things got worse last year when he had to undergo Tommy John surgery in early August. It’s unlikely we’ll see Espinoza pitch again until Instructional League in the fall, but we can’t forget how dominant he looked in his pro debut in 2015. Once he’s fully healthy, we will soon remember why he was so touted a couple of years ago. 75. Alex Faedo, SP, Detroit Tigers (NR): Detroit’s first round pick from 2017, Faedo brings some excitement to a generally moribund Detroit system, and there are some prospect lists that have him much higher than this. But considering he didn’t make his pro debut last year, we opted to reserve judgment. Still, Faedo pitched some important games in college with the Gators, and although he’s winless in his first six starts at High-A, the numbers have been very impressive. This kid will make a huge jump on this list by next year. UPDATE: Faedo’s last start on May 11 did not go well at all, hurting his overall numbers. 76. Harrison Bader, OF, St. Louis Cardinals (NR): St. Louis’ third round pick in 2015, Bader showed some sweet power at Triple-A last year, earning his first look in the majors, during which he put up some decent counting cats. He graduated to the bigs full-time this season, and has stepped up his play, already matching his run total in seven fewer games. Some injuries in the Cardinal outfield have given him a chance to play more, and he’s shown nice on-base skills. This season, he’ll need a clearer path to PT to become Fantasy worthy, but we still really like his long-term prospects. 77. Jay Groome, SP, Boston Red Sox (33): Groome has had a tough time staying healthy since Boston took him with its first round pick in 2016. Last year, he went winless at Low-A despite pitching very well, and then got roughed up in Class-A. This season, he began the campaign on the DL with an arm strain, a similar injury that caused his 2017 to be shortened. Groome also started last season on the DL. Once he’s healthy, he’ll have to start out at Low-A once again, but in time he could become a solid mid-rotation starter. UPDATE: Groome underwent season-ending Tommy John surgery on May 15, meaning he likely won’t return until around mid-season 2019. 78. Stephen Gonsalves, SP, Minnesota Twins (NR): Minnesota’s fourth round pick in 2013 has made steady progress, earning a mid-season promotion in each of his five pro seasons. Last year, he was not as dominant in 15 Double-A starts and upon promotion to Triple-A, he struggled for the first time in his career over five appearances. The Twins opted to start Gonsalves back at Double-A this year, and after going undefeated in four starts, they quickly bumped him back up to Triple-A, where he’s looked even better going undefeated in his first two starts. After being named Twins Minor League Pitcher of the Year in each of the last two seasons, he’s now on the cusp of a callup. UPDATE: Gonsalves’ third start at Triple-A wasn’t good, as he was roughed up something fierce. 79. Riley Pint, SP, Colorado Rockies (43): Pint’s stuff is superb (having been compared to Justin Verlander), but getting a handle on it has been another story. He slipped in the rankings this year after a tough full-season debut. Back at Class-A this year, Pint was rocked in his only start so far, landing on the DL with the ever dreaded diagnosis of forearm tightness. As a result, he’s dropping off many prospect lists, and may very well slide on our list as well next season, pending his return to health and how he performs over the remainder of 2018. 80. Tyler Mahle, SP, Cincinnati Reds (NR): We liked Mahle enough to recommend him when he was promoted last August. It was a solid pick, as after a so-so debut, he was dynamite in September, recording a 1.80 ERA over 15 IP. The young righty’s ERA is up this season, but his WHIP is much better and with an xFIP of 3.49, it’s clear Mahle is pitching much better than his bottom line results suggest. 81. Corey Ray, OF, Milwaukee Brewers (35): The fifth overall pick in 2016, Ray’s development has been slowed by injuries. Last year, he stayed healthier, racking up a decent amount of total bases at High-A. This season, Ray has started delivering on his promise, posting an improved walk rate at Double-A. He’s scoring plenty of runs, but continues to post poor batting averages, and that will need to be addressed if he’s going to reach his potential. UPDATE: Ray has hit leadoff homers in three straight games, going yard four times in total over this span, and a .390 mark over the last 10 has addressed his BA issues. 82. Luis Ortiz, SP, Milwaukee Brewers (65): Ortiz has stayed healthy the last couple of years, but seems to have stalled at Double-A. This year, however, it looks like he’s finally mastered the level, albeit in a swingman role. But given Ortiz’s massively improved ERA and fine BAA, he’s ready for Triple-A, and soon, the majors. His career ERA as a pro is back under 3.00, but is his future in the rotation or the bullpen? That’s the big issue here that will dictate his future value. UPDATE: Ortiz landed on the DL near the end of April with hamstring tightness. 83. Jon Duplantier, SP, Arizona Diamondbacks (NR): Duplantier was Arizona’s third rounder in 2016, and the righty was filthy good last year. He was virtually unhittable at Class-A before a promotion to High-A, where his WHIP was higher, but still extremely solid. Duplantier’s ERA is up at Double-A so far, but still very respectable, and really, he’s only had one rough outing out of three starts. In his first 29 pro games, he’s suffered all of four losses. UPDATE: Duplantier has looked good in each of his last two outings, giving him 31 pro games with just four losses. 84. Carson Kelly, C, St. Louis Cardinals (59): Kelly had a solid season at Triple-A last year, flashing more power than ever and earning his first look in the majors, where he struggled to accumulate many counting cats. He was off to a slow start at Triple-A this year, but was recalled recently when Yadier Molina got hurt. Kelly is seeing sporadic PT so far, and he’s done nothing with the bat to earn more. It’ll be interesting to see what he does over the next few weeks. UPDATE: Kelly suffered an injury of his own, landed on the 10-day DL on Thursday with a hamstring woe. 85. Miguel Andujar, 3B, New York Yankees (NR): Andujar burst onto the prospect scene last year by tearing his way through Double-A and Triple-A, earning a brief look in the bigs along the way. This season, he earned his way onto the team early, and has hit well. Andujar isn’t hitting as many groundballs as he did last season with the Yankees, and his HR/FB rate is lower than what he showed at Triple-A. Still, he’s settled in nicely as the seventh man in the Yankee lineup, and it looks like he’s in the bigs to stay. This entry was posted on Friday, May 18th, 2018 at 5:48 pm	and is filed under BASEBALL, Prospects, RotoRob, Scouting Report. You can follow any responses to this entry through the RSS 2.0 feed. Both comments and pings are currently closed.